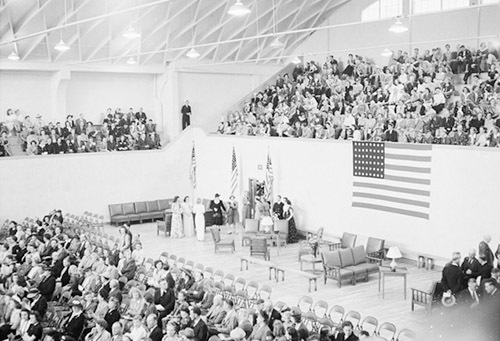 The Astoria National Guard Armory was built in 1941-42 by local contractor, John Helstrom. The city government deeded the land and old city hall which was being used as a hospitality room for troops to the state government. The roof structure was developed in Holland. Mac Court, at University of Oregon, was constructed in 1926. It is the first known building to have used it on the West Coast. 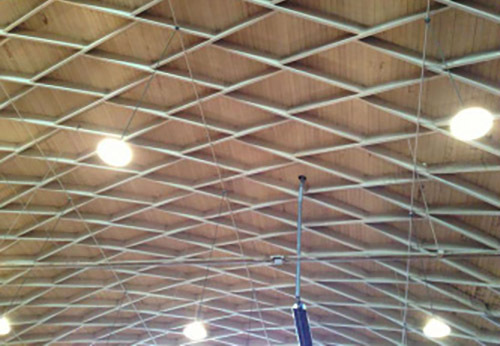 The building was later expanded, hence why an additional truss system was installed that protrudes from the roof. The Astoria Armory, designed by John E. Wicks and his daughter Ebba Wicks, also uses the lamella roof structure. It is unclear whether Wicks designed it, or if it was designed by architects and engineers at Ft. Lewis who ensured that the building met military standards. Most people are familiar with two sports stadiums that used the lamella roof structure in a dome-like shape: the former Astro Dome in Houston and the Super Dome in New Orleans. 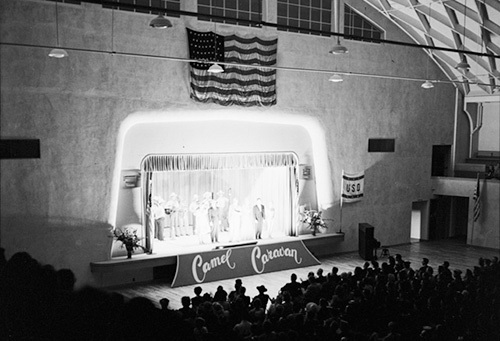 The dedication ceremony and formal opening of The Astoria Armory and USO club took place in the summer of 1942, with the Master of Ceremonies Pinky Tomlin and the The Camel Caravan playing to a packed house. 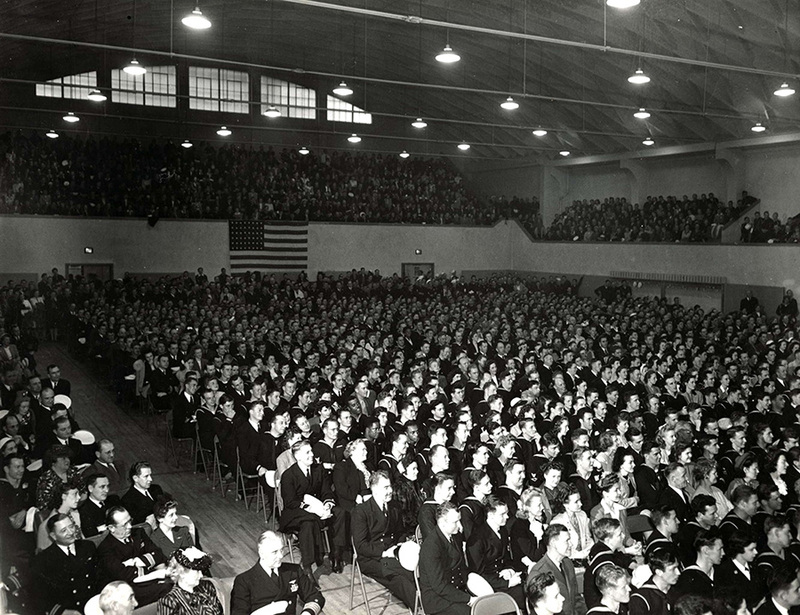 Throughout its early years, The Astoria Armory was used mainly as a recreation center for troops, administered by the USO during WW2. 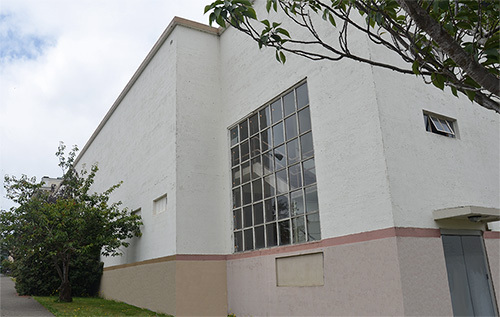 For the decades to follow, the Astoria Armory became a venue for numerous local sporting events, famous concerts, political rallies, and even served as a community roller rink. Another packed USO event during the 1940’s. No wonder this venue was so popular for the community, where else could you host a show with over 2700 people in the audience. 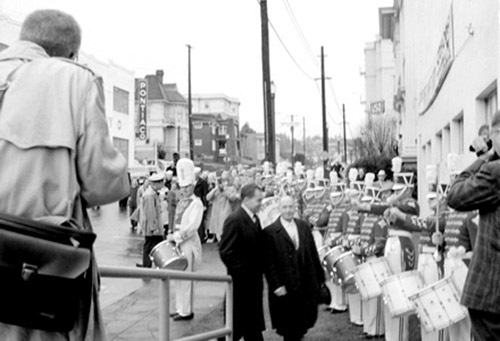 The Armory was the entertainment center of the North West.